Disruption, delays, travel chaos, fierce debate and financial woe have been regular newspaper headlines since Edinburgh announced plans to bring back trams. Edinburgh's first tramway network was a horse-drawn service from Haymarket to Bernard Street, opened in 1871. In January 1888, a cable system came into operation. With amalgamations with the electric Leith system and a takeover by Edinburgh Corporation, the trams were all electrified in 1923. 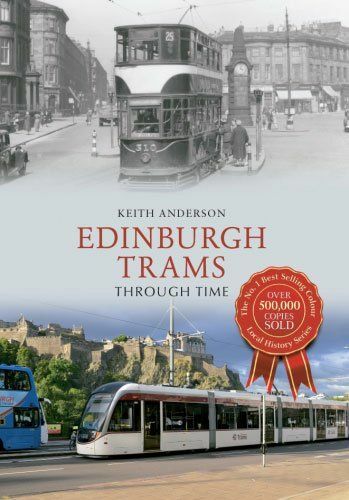 In Edinburgh Trams Through Time, Keith Anderson explores the city's long love affair with trams, identifying key events, individuals, technical advance and organisations that delivered the first eighty-five years of tram service, the reasons behind the scrapping of the fifth-largest tramway in the world, the changed environment reversing that decision, and the challenging and fraught project that returned trams to service.